Remember this little gem? This tiny peach colored sweater waited forever and a day for buttons.I used fine yarn and ridiculously small knitting needles. (which I swore I would never do again.) Well, one thing is for sure, it was worth the wait. Could anything be sweeter than my friend's grand-daughter "Harper" wearing it? She looks adorable and it fits her perfectly, but it won't for long I'm afraid...the good news is I do believe my friend is expecting yet another grand-daughter in early summer. It will definitely be a hand me down. Jackie the sweater fit Harper like a glove. Being only 5lbs 15 oz. She has it on every day. Thank You again. It is beautiful. 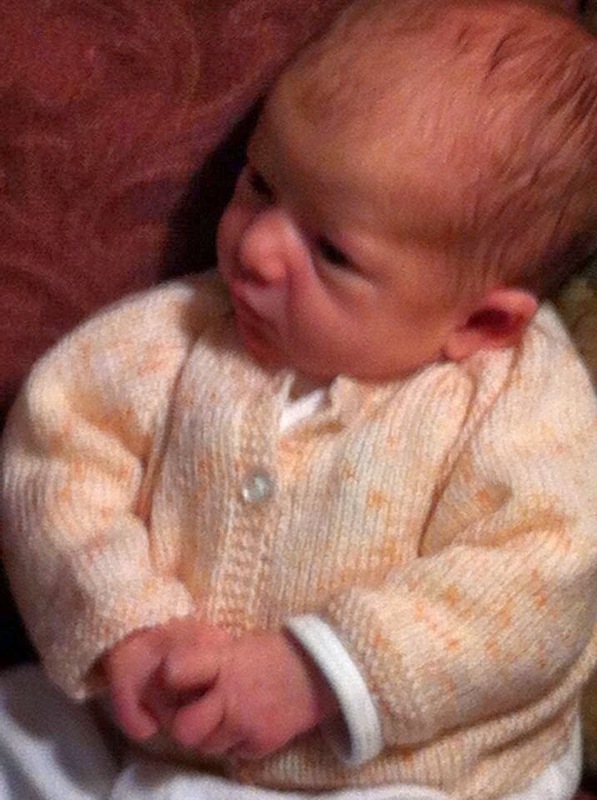 The sweater is so pretty and looks so nice on the baby. You really do beautiful work! I hope all is well with you and enjoying Spring! Finally finished aha such comforting words....that sweet little cardi is adorable!! Thank you so much Daisy! Thanks for looking?